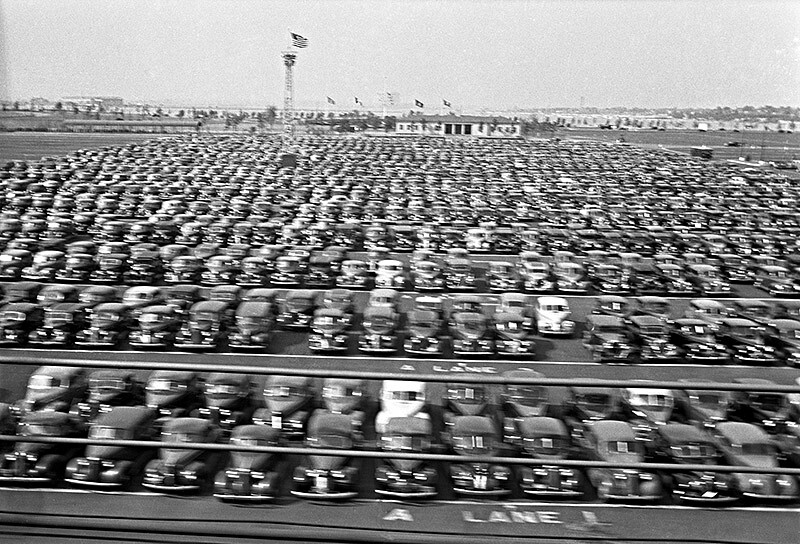 A few days ago I posted a picture of the groundbreaking ceremony for Shea Stadium, and folks were commenting that it was a former parking lot for the 1939-40 New York World's Fair. Here's a shot of that same lot on September 21, 1940. It's a bit blurry as it was shot from the subway train, but it gives an idea of how large the lot was - and this was just one of the lots for the Fair. That's the Howard Johnson's restaurant in the background. And not only are most of the cars black-- but I've never seen any indication of parking lot markers or signs in photos like these. Would be a potential nightmare after dark (and a few rounds at the Schaefer Beer Pavilion)! Maybe you just kept trying keys and if the car started you took it. I remember the discussion and photos of the Howard Johnson restaurant some time ago. I love photographs like this one; the "then and now" concept is fun. Look at the size of that flag. Car companies didn't use a large number of unique keys. I had a colleague who, in the 70s, had a rental Chevy when visiting Motorola Semiconductor in Phoenix. When he left the meeting, he unlocked the car, got in, and drove to his motel, only to realize a mistake when he found someone else's luggage in the trunk. My first car was a 1960 Chevy Impala. Another gut that worked at my Scout camp had one as well. His key would open and start mine, but mine didn't work on his. That's strange. Could they have made a master key provision for service shops? I would think master keys would have to be registered. When my dad was a mechanic, the shop had a registered set of burglar tools for "keys locked in car" use. Of course, there's aways the old coathanger. Looking through my 1939 season ticket book - things which I never have time to do -, I found a parking lot stub I have never seen before. It is small - goes on your dashboard I guess. All I have seen is the blue parking lot map thingie and I can't recall if those were '39 or '40. When I can I will scan this stub. PS - I hope you like my new icon. It is made from a superb image i just got! I'm sure many will recognize it even with this colored appearance etc.